Plans by D’Banj to have a dominant hold on the entertainment industry suffered a setback following Olamide’s rejection of his offer to bring him to his label. For weeks now, the world had been told that D’Banj had planned the rave of the moment to his management team and many were excited about the partnership prospect, but R gathered that Olamide turned down the Koko master’s offer, preffering to roll alone for now. 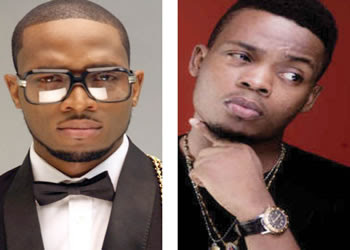 Olamide, who does not want to play the fool at this phase of his career, politely told D’Banj that he was not ready to surrender some of his powers, especially having to be booked for shows only by D’Banj’s management outfit, pleaded for time to even think about the offer as he still wants to work with his present team and taking things as they come for now. He believes that for now, there is nothing D’BANJ could do for him that he can’t do by himself. In the future, I will consider his offer. If anybody wants me, he should have unfettered access to me. I am just starting out in the profession’, he told close friends. “Apparently, he would have been blocked from having direct access to his clients and that will reduce his share from his appearance fees. He does not like the bottle necks and some terms that will make it difficult for him to be reached all because D’Banj wants his value to rise. That may happen, but what eventually gets to Olamide will be peanuts”, R source added, when asked why the deal was botched. He added that the success that Olamide is enjoying now informed his decision to opt out of the deal because there is nothing, apart from management offer, that he stands to benefit from. “Olamide can be easily reached by anybody and his fees are still okay. The moment he signs the deal, he will be getting fewer shows, though huge fees, but will lose many of his grassroot fans to the elitist crowd D’Banj belongs” he added. Since D’Banj couldn’t have the “Ode Lon Like” crooner, he has reportedly reached out to Durella.